Beyond the shape and colours blue and green. Then maybe, you can describe the wonders you have seen. And traveled to places he has never been. Unlike the calming blue and green of the quiet sea. While a lazy person, like him, might just stay home to drink tea. But admits later in life that sometimes it is wise to simply flee. Only to realise that there is one thing he is unable to describe to this day. He learned everything there was in the world, but forgot about himself. Now, he looked himself in the mirror and did not know what to say. A Case Of You (2014). If you liked 500 Days of Summer as well as Blue Jasmine, you might like this film quite a bit as well. Being more on the indie side, you will find a lot of beautiful wide angle shots of the various settings as well as wonderful music. A sweet story of a struggling writer that becomes everything he is not to chase the girl that caught his eye and writes a book about it to achieve his dream of getting published, while discovering what love might really be about. I was keen to watch the movie because it was an interesting concept of how anyone can be anybody’s dream person just by finding out what the person likes and not likes through social media, and in this case, Facebook. Information is everywhere and it does make me wonder why people, like me, are still unable to find that ‘Special One’. Maybe similarities are not necessary in a relationship? Maybe just trying hard to win over someone might give you a chance, even though you are nowhere close to the dream set of requirements? The story itself put a lot of questions out there for the viewers about identity, self-love and loving somebody else. And how easily available information is these days. On screen, some moments of the film did not really work for me and I was rather bored twenty minutes into the movie. The establishment of characters were alright at the beginning – not too long or short. It gave me enough time to have a vague idea of the different personalities of the characters and their relationships with each other. But boredom hit me when the conversation with the guitarist came and the sequences after seemed repetitive to me, after the mild humor was lost. Things only started picking up after the main character, Sam, finally had the guts to ask Birdie out on a date. Because I finally saw the character being thrown into situations that was new to him and he showed so many different sides of himself to the audience. It was also nice that the free-spirited Birdie complemented Sam’s indecisiveness and awkwardness with her positive energy for life and things that make her happy. Their dynamics were interesting to watch on screen and I thoroughly enjoyed watching their scenes together throughout the movie. Even though Sam’s angry outburst nearing the end was abrupt and I felt the previous scenes did not show enough to justify that climax, the ending was nevertheless heartwarming and satisfying for all the hopeless romantics out there. But the best part for me was definitely when Sam’s book, which was essentially a story about him and Birdie’s relationship right from the start, gets dissected by his agents and it becomes a rude awakening for him. Like a sudden reality check that finally woke him up. In that moment, there is this strong sense of reality for me. Sometimes, we do things and we get so engrossed with the details and our own feelings and intentions that we are unable to see things from a different perspective or the bigger picture. To me, it was a reminder that we can only indulge in ourselves for this long before we really have to see things for what they are and choose whether or not to do something about it or just stay put within our little bubbles and turn a blind eye to everything else. With all that said, it was not fantastic but I do appreciate the sentiments of it and what it shared with me. Hello all design lovers! This is an exhibition I hope you guys did not miss because it was pretty wonderful to view, learn and appreciate different kinds of designs in a comfortable space. The exhibition layout was simple, minimalistic yet informative and interesting at the same time. It also helped that there was natural lighting coming in from the glass panes since it was held on the third level of the Art Science Museum. Neatly split into nine different categories such as furniture, graphic design as well as film, the exhibition successfully showed the exploits and artsy adventures of the most famous couple in design history – Charles and Ray Eames. Illustrating their lives and works throughout the years, it showed how their work grew with them and how their influence is here to stay. The entire exhibition definitely engaged me through the vivid colours used as well as font used for the signs and information boards. They made the whole place very comfortable to be in and not intimidating at all. The font was really reader-friendly so it did not hurt my eyes to read the information. That was a good experience. I must also say that the information were written in a clear and concise manner with minimal jargon used which was considerate for newbies and art appreciators like me. If I had to pick a favourite section of the whole exhibition, it will definitely be photography. Photography says a lot about the people behind them. Like, the perspectives they chose, the lighting they shot with, the objects they focused on and the little details like that. Well, a picture is worth a thousand words and that particular section of the exhbition definitely proved that phrase to be true. It was breathtaking to look at rows and columns of photographs of people, crafts as well as their home in so many different ways. Like, viewing their lives through different windows of time, space and moments. Lastly, I liked how most of their art explorations were shown even though they were mainly known for their chairs. Sometimes, people only focus on reporting and understanding iconic works of art, and neglect the other works that showed potential or works that were part of the developing process. But this exhibition tried to cover as much ground as possible without losing focus on Eames’ greatest designs for chairs that made them famous. It made me understand the couple better and view them in a more wholesome manner. Just like how most people have various hobbies and talents besides their day jobs, famous people have them too and it was interesting to view and learn about them through the things they do in their everyday lives behind the glory and media view. So it was a gorgeous afternoon spent with beautifully made chairs, well thought out posters as well as mind-blowing films. Awesome. Dinosaurs: Dawn to Extinction (2014). Yes, I am aware that I just visited a dinosaur exhibition recently at the Science Centre. I just cannot get enough of these creatures alright. However, the experience was very different from the last one. Maybe it is the location, the arrangement of the exhibits or the compulsory photo-taking at the start but the atmosphere felt a little less fun compared to my experience at the Science Centre. Possibly because there were no life-sized machines that took my breath away or amazing soundscapes. It felt very much like a museum instead of me stepping into a different world to learn and explore a different time. It is a little hard to put the feeling into words. Anyhow, I enjoyed my time and took my time learning as much as I can while children were running all around me. There were fossils as well as skeletal casts of various dinosaurs. The exhibition tried to provide a wide range of land, sea, big and small dinosaurs to be put on display. It kept the interest going throughout the exhibition and I really liked how models of dinosaurs were made and placed next to their skeletal casts. It definitely helped me imagine how they looked like and might have behaved in reality. Some of the models were made to scale as well, which was really awesome and made me feel a tiny bit closer to them. There were sections when fight scenes were recreated as well as dinosaur models were placed in an artificially-created environment to give us an idea of how they each might have interacted with each other and how they lived among nature back then. Those were pretty cool and I spent quite a bit of time at those sections. They were all carefully recreated so it was easy to suspend my imagination and just go with it. Technological use, such as sounds, were pretty minimal and the quantity in fossils, models as well as activities (touching replica bones, story-telling for children, etc) made up for them. Also, a lot of information was given in signs, labels as well as a few documentaries. It got a bit overwhelming for me as some spaces were just framed notes and signs, so a lot of reading was done and they were less visually stimulating. The whole exhibition was real long too – a lot of things to cover and to remember if you are there to learn – so I felt a little tired after looking at the fluorescent lights and words for a few hours. However, I must say that having artworks put up and shared was a wonderful experience. The quality of the drawings and paintings made were pretty amazing and they captured the surroundings of the creatures as well. It gave me images to imagine and feel, which was nice. The details, proportions and the way in which these creatures moved were captured in the pieces of art – be it sketches, skeletal drawings or paintings. It was just wonderful to learn from art instead of reading. Something refreshing for me. Well, hope there will be more dinosaurs discovered the next time round and a little more excitement. I have seen this book around – be it book stores, libraries or in the hands of others – but I have never really felt like reading it. Okay, I used to like reading romance but eventually, I got bored of the typical happy endings and started craving for writings that tell more truth than fiction. In terms of situations, imperfections as well as emotions. Maybe it is because I am starting to grow up and outgrew my rose-tinted glasses. But a friend of mine lent it to me this year and said that I should read it since I will probably like it. So I decided to give this book a chance and yes, I liked it. 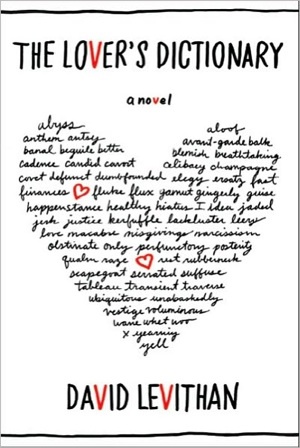 Beyond the romantic and quirky cover, the writing focuses on the various moments throughout the couple’s relationship. It kept things simple and clean, though the words used may break your heart from page to page. Certain moments and words broke mine, anyway. The language was poetic though simple, and made the moments easy to imagine and to relate to. Even though I may not relate to the specific activities or arguments involved, I was able to relate to the anger, frustrations and thoughts that were put into the book. It was like a mutual understanding or having your friend go “I totally understand what you mean” while you whine over a situation over coffee. The book made me feel like I was not alone when I had my bad experiences, and it was therapeutic. A nice feeling to have. It is a short read but it illustrated the good and bad of the relationship, which was nice. After all, every relationship has its ups and downs such as paying the bills, moving into a new house and trying hard to look beyond the differences in everyday habits and making the choice to stick together. Real problems that people usually do not show or talk about on television, movies as well as some books. I truly appreciate the reality of this book. And how the writer weaved the beauty of words together with the little moments of reality was wonderful. It made me think of all the little moments in my life and remembering that those gestures were made with love, no matter if they were shown in a tough way or a way that I was not able to appreciate then. When I listen to stories, people are always trying to pick a big moment like wedding proposals in a cinema full of people or relationship anniversaries at expensive restaurants. I seldom hear stories about simple yet nice moments so this read was a comfortable one and made me think of all the little things in my life. Definitely a nice and easy read that I can reread for a lifetime and constantly getting new lessons, new perspectives and new insights as I grow up with it.